How America embraced TV and made it it's own. Feel free to use the SHARE button below to share this site with anyone you think might support the project. THANKS, your support matters! 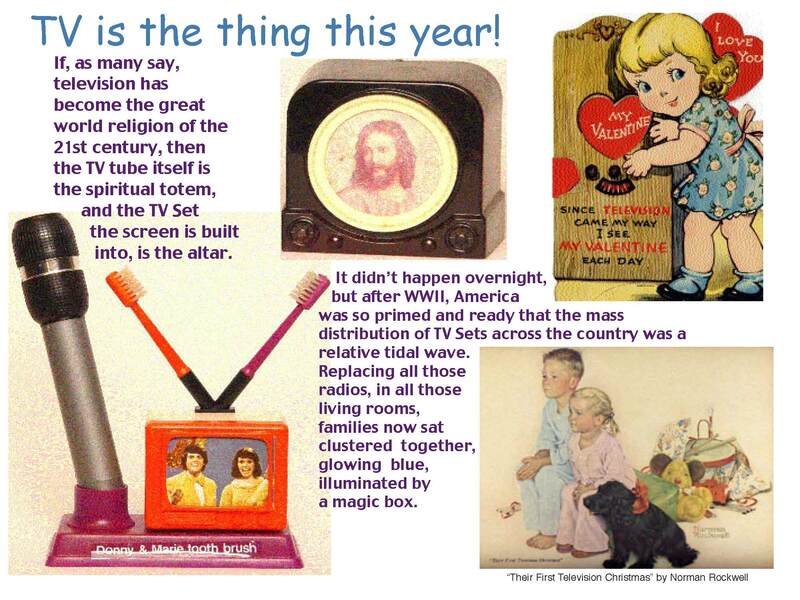 If, as many say, Television has become the great world religion of the 21st century, then the TV tube itself is the spiritual totem, and the TV set the screen is built into is it’s alter. It didn’t happen overnight, but after WWII, America was so primed and ready that the mass distribution of TV Sets across the country was a relative tidal wave. Replacing all those radios, in all those living rooms, families now sat clustered together, glowing blue, illuminated by a magic box. Suddenly, the most ridiculous object you could imagine incorporated the shape of a TV screen, with a volume and channel knob beside it. Or the item was recast as a look-alike TV set, or at the very least, its box was shaped like a TV. All these odd items and powerful images have left a uniquely rich, visual legacy. 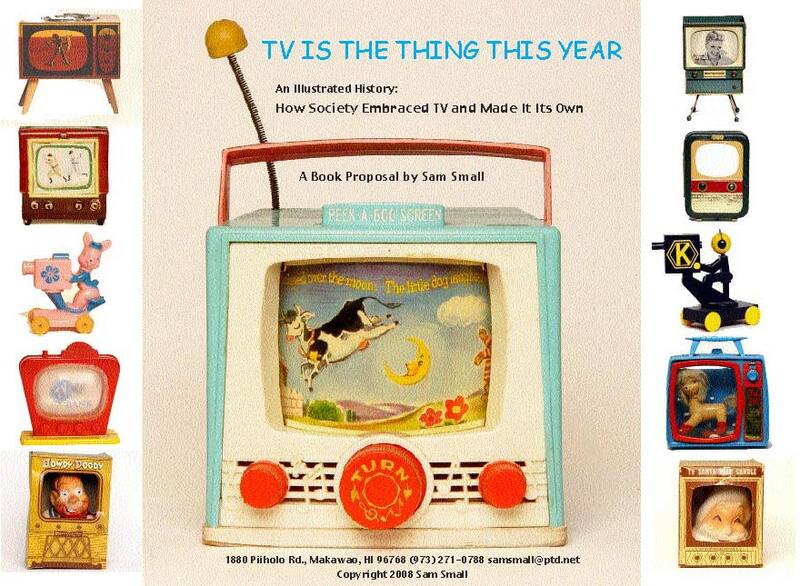 TV IS THE THING THIS YEAR presents “in living color”, thousands of Television objects and ephemera, from 1880 to today. We’ll take a close-up view at Television Sets and T.V. Cameras and see how their shape, form and social identity has been reflected back by American culture. 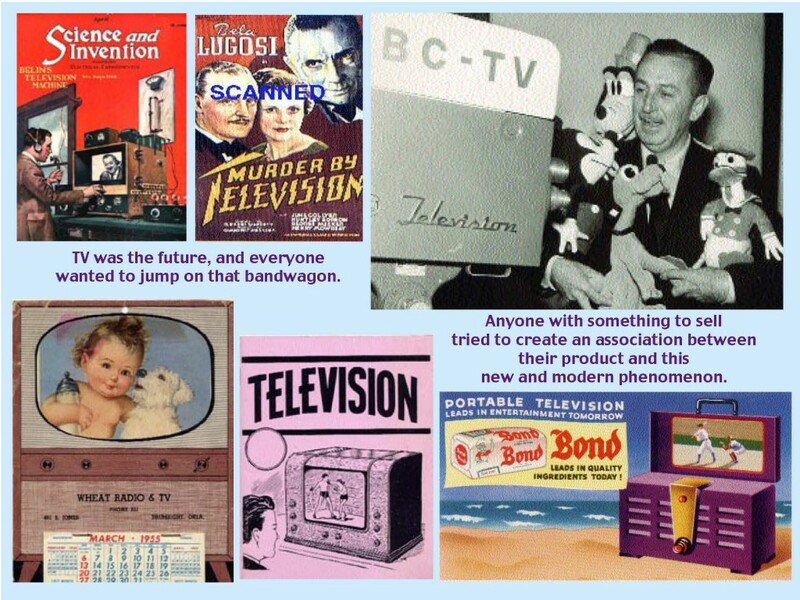 That early 50’s tidal wave of Television had various subtle but measurable impacts on many levels of our society. Included in this book are a variety of literary excerpts and factoids that help put Television and our TV shaped objects into a cultural perspective. Ultimately TV IS THE THING THIS YEAR delivers a strikingly visual and unique social history of this great and truly American icon – Television. There Has Never Been A Book Like TV IS THE THING THIS YEAR. Most books about television focus on the programs and personalities that appeared on tv; a few have railed against the negative impact TV has had on american life, but no book before has sought to show how quickly and so thoroughly society embraced the television set in our midsts. Just as a “Cargo Culture” tribe might adopt an airplane into the myths of thier gods and seek to recreate the plane after it flies away, so too have we turned the TV set into a spiritual totem and saturated its shape and form into our collective consciousness, as evidenced by a thousand stupid things in the shape of a TV.